Features a beautiful photo of University Hall and the Van Wickle Gates mounted above your diploma with a masterpiece medallion your school seal and the school name gold embossed on black and gold museum-quality matting. It is framed in Murano moulding crafted of solid hardwood with a high-gloss cherry transverse grain and a gold lip. Church Hill Masterpiece Campus Scene diploma frame with colored Masterpiece medallion, gold embossed school name, Campus scene, black and gold matting, and Murano moulding. Cardinal and black Crest Masterpiece medallion on top; 'BROWN UNIVERSITY' embossed in gold on bottom. Diploma size increased after May 2011; please choose based on graduation date. Please select option for Church Hill CS Photograph Diploma Frame - BA/MA/PhD. 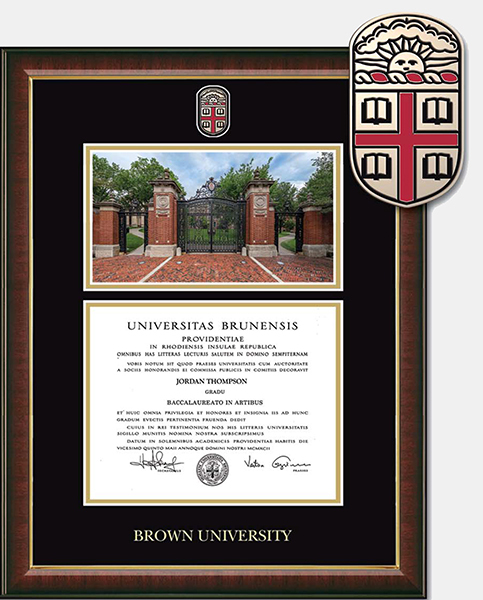 The Brown University seal and name are featured with vibrant color and added depth on textured ivory and brown museum-quality matting. Our industry-exclusive, state-of-the-art dimensional color makes your school's marks pop! It is framed in Westwood, our contemporary moulding featuring a walnut brown finish with gray undertones and warm, gold accents. 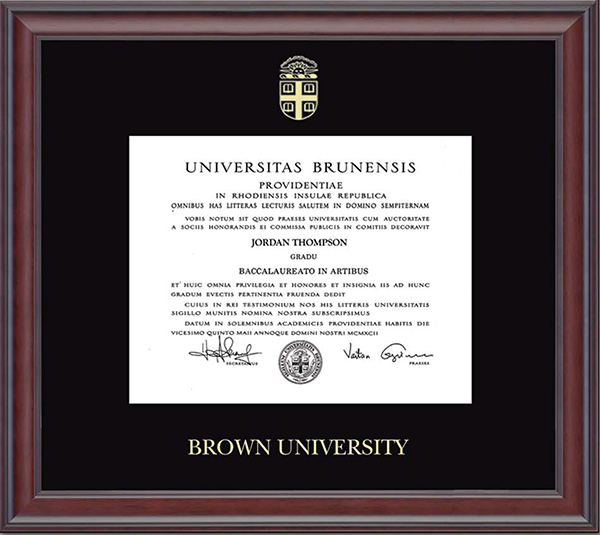 Church Hill Dimensions diploma frame with raised logo and wordmark, textured ivory and brown matting, and Westwood Moulding. Grey, cardinal, black, and gold Crest on top; 'BROWN UNIVERSITY' on bottom. 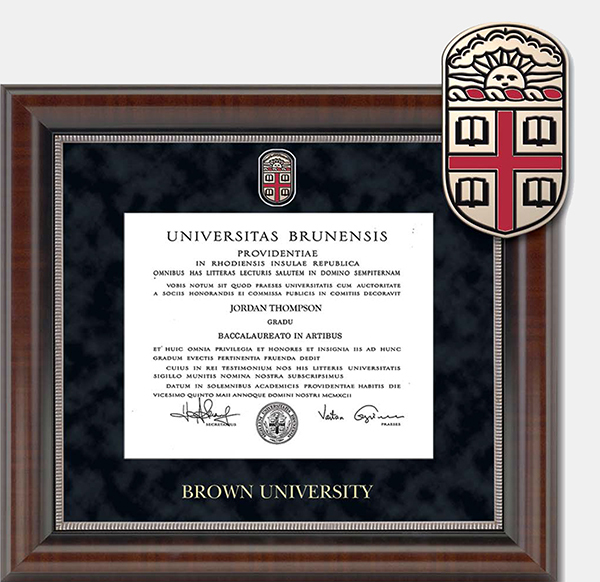 Please select option for Church Hill Dimensions Diploma Frame - BA/MA/PhD. Features the school name and official seal gold embossed on black and red museum-quality matting. It is framed in Gallery moulding crafted of solid hardwood with a high-gloss cherry lacquer finish and gold inner lip. Church Hill Gold Embossed diploma frame with gold embossed seal and school name, black and red matting, and Gallery moulding. Gold Crest embossed on top; 'BROWN UNIVERSITY' embossed in gold on bottom. Please select option for Church Hill Embossed Gallery Diploma Frame - BA/MA/PhD. Features the school name and official seal gold embossed on black museum-quality matting. It is framed in Studio moulding crafted of solid hardwood with a deep mahogany furniture finish. Church Hill Gold Embossed diploma frame with gold embossed seal and school name, black matting, and Studio moulding. Gold Crest embossed on top; 'BROWN UNIVERSITY' embossed in gold on bottom. 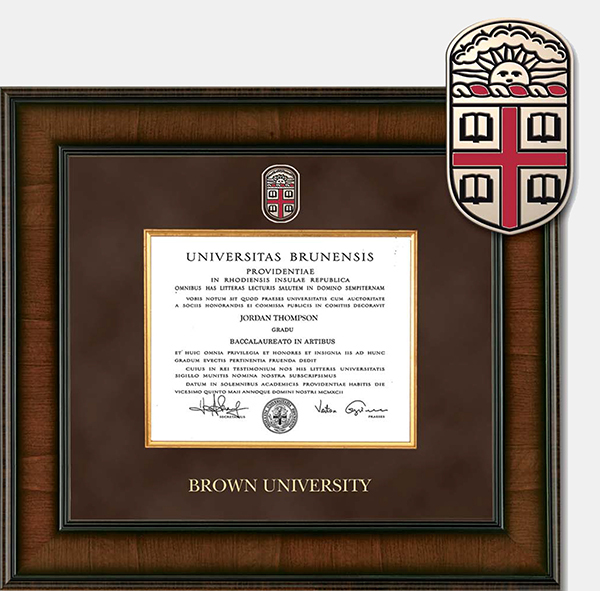 Please select option for Church Hill Embossed Studio Diploma Frame - BA/MA/PhD. Presidential Edition features a Masterpiece medallion of your school seal set into an archival-quality brown suede mat. This edition is enhanced with a gold wood fillet and framed in our Madison moulding with a handsome flat panel profile in a dark walnut finish. 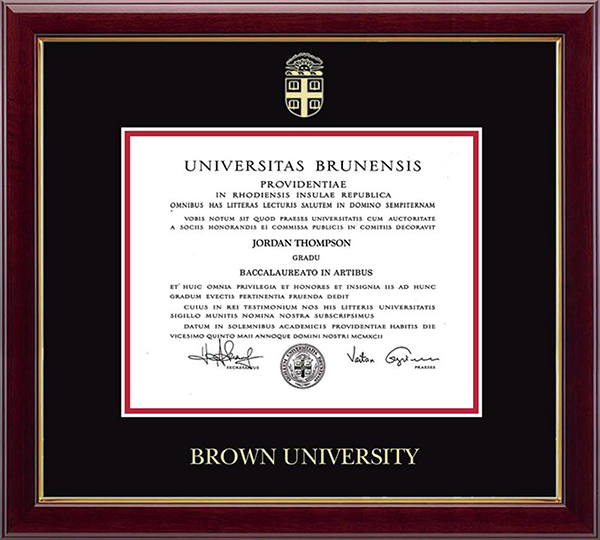 Church Hill Presidential diploma frame with colored Masterpiece medallion, gold embossed school name, gold wood fillet accent, brown suede matting, and Madison moulding. Cardinal and black Crest Masterpiece medallion on top; 'BROWN UNIVERSITY' embossed in gold on bottom. 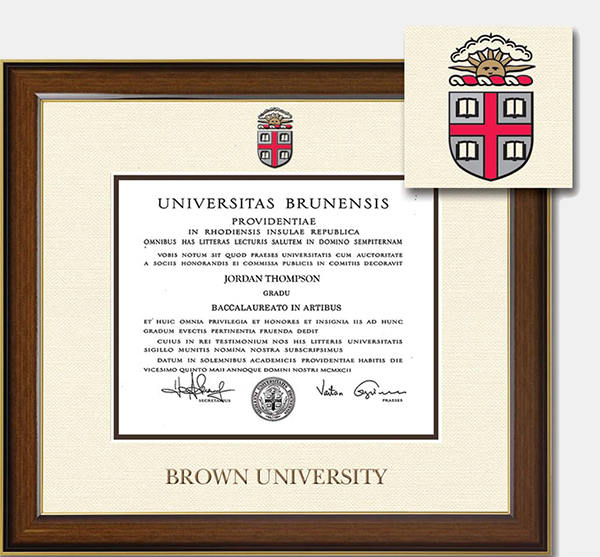 Please select option for Church Hill Presidential Madison Diploma Frame - BA/MA/PhD. Features a custom-minted brass medallion of your school seal enhanced with hand-painted color enamel accents within black suede museum-quality matting and the school name is gold embossed below. It is framed in Chateau moulding with a rich French walnut finish and coordinating inner lip. Church Hill Regal diploma frame with colored Masterpiece medallion, gold embossed school name, black suede matting, and Chateau moulding. Cardinal and black Crest Masterpiece medallion on top; 'BROWN UNIVERSITY' embossed in gold on bottom. Please select option for Church Hill Regal Chateau Diploma Frame - BA/MA/PhD.